Contribute to the ongoing ministry of ZEMA across southern Africa! Andrew, Phiona, and their young son Joshua Sisson serve the amaZioni from ZEMA’s home office in Chicago. Andrew grew up in Zion with a family that traces its missionary heritage in South Africa all the way back to the 1920s. Phiona comes from Kampala, Uganda where she started her own hospital ministry to the poor people of her own country. 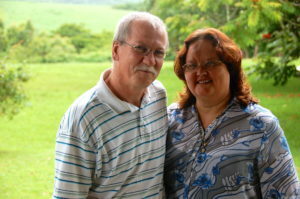 Barry and Louise Adkins both felt a call to be missionaries for many years. Through the Akers and their passion for the amaZioni, they began to feel the pull to South Africa and ZEMA.They joined ZEMA in 2005 and have no doubt that they are doing exactly what they were made to do. Having recently moved from Mthatha, they are currently working to build relationships with the amaZioni in Port Elizabeth. They run a ZEBS and are involved with mentoring and discipleship groups as well as forging inroads to the Zionist churches in the informal settlement where we are currently concentrating our efforts. With so many amaZioni wanting to be taught the Bible, the opportunities are overwhelming. We have seen God working in the lives of the amaZioni and believe that God has great plans for the future. Richard and Geraldine Akers are native South Africans who joined ZEMA in December 1989. They are based in Nelspruit Mpumalanga and their ministry is in with the ZEBS classes in Mozambique as well as the Mpumalanga province of South Africa. Dennis grew up in Zambia on the mission field, I (Caitlin) grew up in Iowa, and we met at Moody in Spokane, Washington. We both knew God wanted us ministering overseas, but neither of us knew how or where. Through our friendship with Stephen and Jessica Langley, we came into contact with ZEMA and found out about Sunbury Bible Camp, and from then on God has made it clearer and clearer that is where He wants us! We plan to join the directing team for the camp as soon as possible. We’re eager to get started on this journey! Jon and Lauren Emanuelson met at at Trinity Evangelical Divinity School and were soon after inspired to work with the amaZioni. They have been in South Africa for seven years. Jon is involved with four ZEBS and also has the privilege of being a facilitator of an accredited, diploma-level program that is underwritten by Mukhanyo Theological College. Jon and Lauren also collaborate on a publication for the teaching and encouragement of amaZioni called The Zion Banner. Most recently, the Lord has opened a door for Jon to start working with a group of Zion leaders to help them implement Biblical churchmanship among their congregations. My hope is to continue offering this course from place to place to such groups of leaders who are looking for this help. Jon and Lauren also consider it a high calling and a great privilege to raise their two daughters and one son to love and serve the Lord. They count it a blessing that Lauren is able to focus much of her attention on this very important task. Luaan Goosen grew up in Queenstown, South Africa. From the time he was working, he had a burden to reach the Zionists in his area—but all of his attempts to reach them failed. Then, while at Bible school in Johannesburg, he heard about a missionary couple, Richard & Geraldine Akers, who were ministering to the Zionists full-time in the Transkei. He couldn’t believe it. So in July 1997, he visited the Akers and saw with his own eyes that it was possible to make inroads to the Zionists. Not only that; while he was there, he met a student from Moody Bible Institute named Susanne. To make a very long story very short, Luaan and Susanne are now happily married and have been working side-by-side with the amaZioni for since 1999. They are currently based in East London, where Luaan focuses on evangelism, discipleship, and equipping Zionist church leaders to better lead their congregations. In addition to caring for their children, Pieter, Sarah, and Katelyn, Susanne teaches Sunday school classes and trains teachers. The Goosens’ desire is to see the amaZioni reaching their own people and even taking the gospel abroad. They count it a wonderful privilege to be in ministry and love the amaZioni very much. Daniel and Beth Hoffman were both raised in northern Illinois. After getting married, they relocated to Wisconsin. Ten years and two boys later, they again relocated back to their hometown of Sycamore, Illinois where they continued to home-school their boys. Beth had experience in Christian Camping and Daniel always loved camping with his family when younger. They felt called into missions and began exploring missions work in 2009 and how their love of Christian Camping could be used. In 2012, they found ZEMA and took a vision trip to Sunbury Christian Camp in KZN, South Africa. They fell in love with Sunbury and the work among the amaZioni. The Hoffmans moved to Sunbury Christian Camp in May 2015 and are Camp Directors where they help run and maintain the facilities to support the Bible training of amaZioni leaders. As of 2018, Daniel and Beth are still homeschooling their youngest son, while their other son has returned to America to pursue additional schooling and work. Matthew Kuehl grew up in South Africa as the child of ZEMA missionaries. He graduated with a degree in Intercultural Studies (Missions) from Moody Bible Institute in Chicago, IL. He served as a summer intern with ZEMA in Swaziland and went on two Missions trips to Malawi. He is currently support raising to return ‘home’ to work amongst the people, the amaZioni, who captured his heart from his earliest memories. Timothy and Luann Kuehl, originally from Zion, Illinois, marked their 32nd anniversary as ZEMA missionaries in 2018. Their ministry includes evangelism, discipleship, and training/empowering Zionists to reach their own people for Christ. They are currently serving in Gauteng Province, which contains 25% of the South Africa’s population in 1.5% of its land area. In addition to ministering in local Zionist churches, Timothy administers and teaches at eight ZEBS, seven in and around Johannesburg and one in Bulawayo, Zimbabwe. Luann teaches children’s ministry workers across South Africa and works behind the scenes in ZEBS. The Kuehls also serve in member care for ZEMA. Paul and Carrie Seelhammer work with the amaZioni in Roodepoort, South Africa, along with their children Luke, Joe, Josh, Abbie, and TJ. The Seelhammers have been ministry partners with ZEMA since 2007. On the field, Paul teaches at ZEBS and works on a radio program for the amaZioni called Trumpet of Zion. He also works with Mission Aviation Fellowship in the Vhembe District and is currently working on translating This We Believe into Tshivenda for the people there. Carrie is preparing for two Sunday school teacher training courses this year and developing new ideas for women’s and children’s ministries. Greg and Carlene Seghers met through Inter-Varsity Christian Fellowship at Northern Illinois University where they were both studying in the early 1980s. They were married in 1985 and moved to South Africa in 1993 to minister among the amaZioni. They have three sons, two daughters-in-law, and three grandchildren. Currently they live at Sunbury Christian Camp in the province of KwaZulu Natal. Greg and Carlene work alongside other pastors and missionaries in a ministry of evangelism and discipleship of amaZioni church leaders. They administrate and support others who run ZEBS in KZN. They also act as hosts and organizers for Zion ministries utilizing the Sunbury facility. Greg and Carlene enjoy opportunities to share the gospel and encourage Zion congregations at their own places of worship. Greg is the current Field Director for ZEMA, so the Seghers spend a lot of time with all of ZEMA’s missionaries. They meet with local families monthly and at least once yearly with those in other areas of South Africa. The Seghers would like to see continued growth in the number of ZEBS and ZBC locations, as well as an increase in the number of native Africans teaching at these schools. Their personal mission statement reflects that of ZEMA: to know God and make Him known among the Zionists. To that end, they’d like to see the number of ZEMA missionaries increasing in South Africa, Lesotho, Zimbabwe, Mozambique, and Botswana. Mark and Barb Hugo and their kids, JJ and Kara, work with both SIM and ZEMA. Their background is in church planting and running a counseling and HIV testing center. When they joined ZEMA in 2006, they managed Sunbury Christian Camp for a while, getting to know the ministry amongst the Zionists. Mark taught at the Sunbury ZEBS and ministered in the local community. In 2012, they moved to Durban, where Mark got involved with three ZEBS (Umlazi, Eswelisha, and Lesotho) and taught at Durban Bible College. They are in the middle of a move—on their way to Cape Town where Mark will be overseeing the work among the Zionists of the Western Cape. There they expect to support the teachers at existing ZEBS, launch new schools, and train up leaders for those schools. Mark will also act as interim pastor at a local church. Upon arrival, the Hugos will be the only ZEMA missionaries in the Western Cape. The Hugos’ vision is to see God meet the spiritual and biblical training needs of the amaZioni of the Western Cape through the provision of ZEBS and discipleship. They prayerfully await the day they can support new missionaries in the area and wait on the Lord for His plans for South Africa in general. Stephen and Jessica were childhood sweethearts in Zion, Illinois. They both went to Bible college in Spokane, Washington, and got married in 2013. From the time they were children, God gave them a deep desire to see His Kingdom spread to the ends of the earth. As they grew older they became especially passionate about the youth in Zionist churches. They moved to South Africa in 2017, and now they live in Pietermaritzburg. This first ministry phase involves studying Zulu with the goal of fluency, and building relationships with local Zionists. Long-term, their ministry vision is to disciple Zionists to disciple Zionist youth. Their desire is to see the next generation of Zionists zealous for the truth of God’s Word and the spread of the Gospel through all of Africa. Through transforming young people, we hope to one day see a transformed continent. Brett and Evelyn Miller moved from Wyoming to Swaziland in 2014 to work at Zion Bible College. ZBC has grown from 39 students in 2004 to about 1400 students in 2018. Classes are held in more than 33 locations, including prisons, and seminars are taught throughout Zimbabwe, Zambia, and Botswana. Brett teaches and works as a member of the leadership board and Evelyn works as office manager. Teaming up with them in Swaziland are missionaries Lynda Collison, Deb Prentice, Dave Rutledge, and Rebecca Rutledge. The vision of Zion Bible College is to be 1) biblically-based, 2) Swazi-led, 3) self-supporting, and 4) sending. It is the Millers’ deepest desire to serve the estimated 18 million Zionists in sub-Saharan Africa. In light of new legislation in Swaziland, the Millers hope to develop gain accreditation for a Zion Bible College and launch several satellite campuses in the growing effort to reach the continent for Christ. Zion Bible Colleges are at the heart of the Millers’ passion, because to affect change in Africa, they believe one must start with the pastor. As the pastor becomes a strong biblical force in the church, the church changes. As the church grows, the community changes. The renewed community then revolutionizes the country and, slowly, the whole continent. Kit grew up in Oregon. His aunt and uncle, Luann and Tim Kuehl, had been part of the Zion mission in South Africa for a long time and told him about the people in South Africa. In 2014, he began training and fundraising and arrived in Johannesburg in August 2015 to begin ministry with amaZioni university students. At many universities in South Africa, Zionists have started their own student groups, with worship services and Bible studies. God has allowed Kit to forge relationships with these students, and he currently meets with Zionists at four different universities around Johannesburg. His aim is to love and serve them and help them learn about God and the Scriptures. It has been a joy for him to be with these students as they seek to follow Jesus together and to work side by side with the Kuehls and the Seelhammers. In the future, Kit would love to see the university students grow stronger in their faith and act as Jesus’ servants to their families, churches, communities, and the AmaZioni movement as a whole. Andy and Heather Sullivan are South African born missionaries. They joined ZEMA in 2008 after Andy had served on the Field Council for a number of years. They worked in Swaziland for several years establishing ZEBS before moving back to South Africa in 2014 where they do leadership training and church development through a ministry called ZEFA. The Sullivans also teach at some ZEBS classes and graduation services when invited and use that opportunity to share about ZEFA.